PR Pocket: Searching For An Accurate Ice Auger Sharpening Grinder? Searching For An Accurate Ice Auger Sharpening Grinder? With winter approaching, Thorvie International is busy manufacturing parts for their AV-41 Ice Auger Sharpening Grinder. The AV-41 machine is one of a kind, allowing precision sharpening of ice auger blades to their factory settings. The ice auger fixtures supplied with the machine hold the blades properly to match the factory angles. These fixtures also allow you to remove equal amounts of material when sharpening sets of blades. The AV-41 sharpens a variety of ice augers including Mora, Jiffy, Eskimo, and Strikemaster Lazer blades. 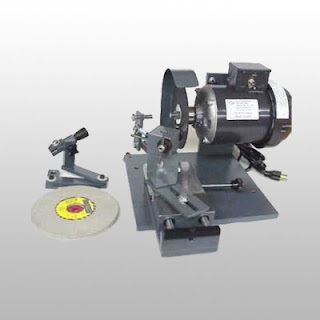 All Thorvie International sharpening equipment comes complete with instructions, training DVDs and customer service. The Thorvie International Team Wishes Former Owner Ken Frea A Long & Happy Retirement! Congratulations to Ken Frea, as his last day of work was September 30th 2016. Ken was a great asset in the Thorvie Company and will be greatly missed. Not only did he provide exceptional knowledge in the tool sharpening industry, he was also a great boss, leader, motivator and friend. Thank you, Ken, for all the guidance and support that you have offered us over the years. We greatly appreciate not only the knowledge that you provided to our team, but also the industry. We wish you the best in your retirement, things will not be the same without you. From us all at Thorvie International, congratulations. Last year I mentioned the topic of not removing the burr on ice auger blades. As a recap, ice auger blades do not need the burr removed from the blade. The ice removes the burr perfectly as the blades rotate and cut through the ice. Removing the burr affects the bottom side of the blade and the cutting edge will dull more quickly. Last season, I received inquiries from purchasers whose customers were concerned with seeing the burr on their blades. Their customers liked to see the “shiny” edge on their blades, regardless the purpose of the burr. If this is the case for you and you’re tired of this issue, on your price sheet simply offer an optional leather stropping fee. Now your customer is happy and you make some extra income.